Our job as hydrologists is to understand and predict the water cycle. Historically, prediction of river flow has been at the centre of our attention. This is not surprising: rivers form a crucial resource, shape our environment, cause natural hazards, and are “easy” to observe. In future, study of river flow will obviously remain important. However, in this blog post we argue that shifting focus towards another part of the hydrological cycle can provide significant opportunities. Inspired by the ‘meet the expert in hydrology – the mystery of evaporation’ session held at the 2015 EGU General Assembly in Vienna, we discuss the role of evaporation in hydrological research and how evaporation affects our ability to understand the water cycle (including river flow predictions!). We do this by exploring (a simplified view on) what we know about evaporation, what key limitations exist in evaporation research, and what the implications are for how we currently do our science. To conclude we provide suggestions on how to better consider evaporation in hydrological research. “There is a lot of evaporation” Most precipitation never ends up in the river, but is instead evaporated. Globally over 60% of terrestrial precipitation is evaporated, leaving 35-45% to runoff (Rodell et al., 2015). The fraction of land surface where evaporation exceeds runoff is over 77% (Fig. 1). This indicates that evaporation strongly influences (if not dominates) hydrologic conditions at most locations in the world. Figure 1: The mean annual discharge rate normalised by the mean annual precipitation rate (Q/P) based on EU-WATCH data over the period 1901-2000. Areas shaded in red are where evaporation exceeds runoff (i.e. Q/P<0.5, and E/P>0.5). “Evaporation is not a single flux” Total evaporation (E) is the sum of a number of different processes: surface evaporation, transpiration, evaporation from interception, and open water evaporation (Savenije, 2004).Very often E is described by evapotranspiration, acknowledging the importance of transpiration to total E. However, it should be remembered that transpiration is not the only important evaporative process. “Evaporation is controlled by multiple factors” There are four primary meteorological drivers of evaporation: Net radiation, wind speed, atmospheric humidity, and air temperature. When water availability is not the limiting factor (i.e. there is sufficient soil moisture) evaporation happens at its potential rate (often referred to as potential evaporation). However, actual evaporation is also controlled by hydrological (e.g. soil moisture availability) and biological factors (e.g. type and growing stage of vegetation). Evaporation cannot be seen separately from the many physical and biological processes it connects (Fig 2). 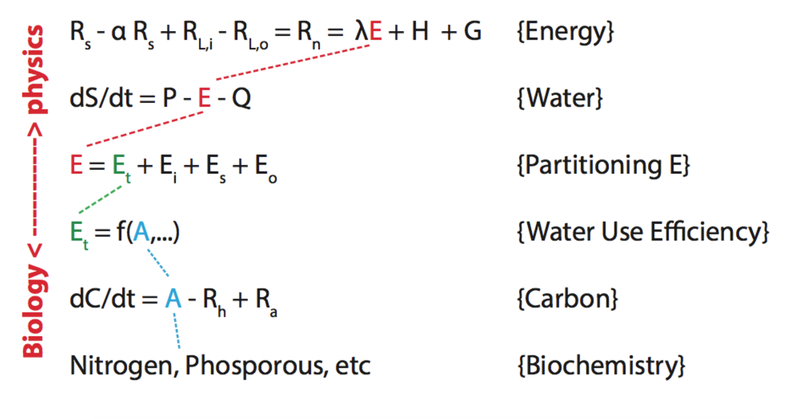 Figure 2: Evaporation (E) is the key process connecting energy and water balances, and the associated biology and biochemistry (Adapted from Roderick, 2015 EGU slides). Et is transpiration and A is assimilation of CO2. “Evaporation is difficult to observe” The single largest barrier to the advancement of our understanding of evaporation is our inability to measure all the components of E at the appropriate spatio-temporal scales required for the majority of problems in hydrology. This is reflected in the fact there are more estimation than direct measurement techniques available. It is possible to measure evaporation at the scale of a point or field under particular conditions with expensive instruments (e.g. lysimeters, eddy-covariance towers, and the scintillation method (De Bruin et al., 1995)), it is not yet feasible to reliably upscale this to the catchment scale and beyond in a cost effective way. Remote sensing is a promising possibility, but is yet too coarse and based on simplified model estimates. Pan-evaporation has been measured systematically around the globe, but does not take account the biological controls on transpiration. “The relative contribution of types of E are unknown” While we know the contribution of transpiration to evaporation is large, we are still unsure exactly how large. For example, Coenders-Gerrits et al. (2014) revise the global estimate of contribution of transpiration to E of Jasechko et al. (2013) from 80% to 90%, to 35% to 80%, and reviews on this topic give wide uncertainty bounds to the obtained estimates (Sutanto et al., 2014). If we don’t know the relative contributions of the various types of evaporation, then this will introduce large uncertainties in future estimates of the water balance. “Trends in E are not obvious” Rising CO2 levels are increasing temperature globally. A common perception is that this temperature increase will cause an increase in evaporation because a warmer atmosphere can hold more water vapour (~6-7% K-1 according to the Clausius-Clapeyron relation), thereby increasing atmospheric evaporative demand. However, as we stated above, changing air temperature is not the only driver of evaporation. A change in any of the four meteorological drivers, soil moisture patterns, or biophysical controls can change the rate of evaporation. For example, it has long been assumed that pan-evaporation would increase under climate change. Despite this, global pan-evaporation observations have actually decreased (Roderick, 2009). The likely reason for this is a decrease in global wind speed (McVicar et al., 2012), yet the attribution of decreasing pan-evaporation is not fully resolved, highlighting the difficulty of disentangling the natural and human-induced drivers of changes in E.
“Increasing model complexity is constrained” Hydrological modelling is our main tool for understanding the hydrological cycle and predicting future conditions. Nearly every model solves the water balance (dS/dt = P – E – Q). The focus is usually placed on simulating runoff (Q) whereby precipitation (P) and some form of potential evaporation are inputs. Evaporation (and storage dynamics) are treated as residual fluxes that are not constrained or evaluated. If evaporation and storage dynamics are not measured we have very little information to constrain our hydrological models; Jakeman and Hornberger (1993) showed that information content in a rainfall-runoff record is sufficient to support models of only very limited complexity; with only P and Q observations we can only warrant a handful of parameters. Including E information in the development, calibration and validation of models explicitly (e.g. by having E measurements available) or implicitly (e.g. by incorporating storage measurements), should allow increasing the number of parameters. Ideally such data can discriminate between the various sources of evaporation. “No standard in choosing which potential evaporation equation to use” There is a plethora of equations available differing in complexity and data requirements with no community consensus on which is best. This makes it difficult to choose which is most appropriate for your study and in general limits hydrological model intercomparison. Oudin et al. (2005) attempted to resolve this ambiguity by comparing 27 potential evaporation equations for use in daily rainfall-runoff models and found that simpler temperature based equations performed comparatively well against more complex formulations that required many more input variables, such as radiation, humidity, and wind speed. Given that many studies are limited by the availability and quality of atmospheric variables, why not use a simpler model with lower data requirements? “Biological processes are rarely included” But is it always justified to run with simplified methods due to your data/time limitations? If the aim of your study is to estimate long-term future water balance then the temperature only equation will not be sufficient and could lead to misleading conclusions. The more physics-based Penman-Monteith equation is more suitable for such cases. Perhaps even more critical to estimation of future water balance is the more explicit simulation of biological fluxes. Prudhomme et al. (2014) show that at the global scale, models that include the dynamic response of plants to enriched CO2 and climate give much lower estimates of future drought as plant stomata can partially close, conserving water and resulting in smaller evaporation changes in a warmer climate. However, the magnitude of these changes remains uncertain and further work is still needed. It is worth noting that most equations currently ignore CO2 fertilization effects. “Understanding drought” Drought is a complex phenomenon but in the most basic form is often defined as a sustained precipitation deficit. The Standardised Precipitation Index (SPI) is one of the most used metrics to characterise drought, but hydrologists have championed the concept of hydrological drought; the initial precipitation deficit propagates through the terrestrial hydrological system, developing a soil moisture deficit then streamflow deficit then groundwater deficit (Van Loon, 2015) – evaporative processes can also work to further amplify drought (Teuling et al., 2013). A more physically based approach is the Palmer Drought-Severity Index (PDSI), a simple water balance model which does include potential evaporation, has proven a useful tool for drought monitoring (e.g. US Drought Monitor). However, it has been argued that it is not appropriate for assessment of changes in droughts under climate change due to its simplicity (Vicente-Serrano et al., 2011); Sheffield et al. (2012) has shown that the use of the temperature only PDSI formulation overestimates previously reported increases in global drought because it does not take account of the crucial factors affecting evaporation like wind speed, vegetation cover and aerosols affecting solar radiation. “Understanding floods” Yes, evaporation is important for floods! While melting snow and/or a lot of rainfall are requirements for flooding, they are not the only ingredients. There are countless examples in the literature where observed or expected future increases in extreme precipitation are inferred to also increase physical flood risk. Despite a robust increase in heavy rainfall, there is little evidence so far that floods are worsening with climate change (e.g. Hirsch and Ryberg, 2012). The dominant drivers of floods are only uncovered when the pre-flood wetness of soil moisture, determined by evaporation, is considered along with extreme precipitation (Berghuijs et al., 2016). This improved hydroclimatic understanding of flood processes might help reconcile the apparent mismatch between trends in floods and extreme precipitation (Kundzewicz et al., 2014). “Start thinking of E critically” We hope this article has made you stop and think about the way you currently consider evaporation within your work. It could be as simple as stating the exact potential evaporation equation you use or even doing a sensitivity analysis using a range of different already available equations. This has never been easier as a new open source R package has been developed by Guo et al. (2016) that enables the use of 17 well-known evaporation models to be implemented in a consistent manner; see this interesting blog by the lead author. Crucially, we as a community need to be more explicit about the implications of the current limitations of our (necessarily) simplified approaches. “Let’s measure E” Do you want to have a model of your catchment that can have more than 3-6 parameters without being over-parameterised? Consider increasing the quality of your input data by measuring evaporation at your study site. This information will better constrain your hydrological model and prediction, allow potential falsification of different model approaches, and will always be an opportunity to learn. An excellent example is the Hydrological Open Air Laboratory (HOAL) in Austria (Blöschl et al., 2016) where students are measuring evaporation (using eddy-correlation instruments), soil moisture, river flow and a full suite of weather variables (e.g. precipitation, air temperature, humidity, and wind speed) which allows richer testing of fundamental hydrological hypotheses. “Let’s measure E together” A concerted community effort is however needed to push meaningful progress for larger-scale hydrological research problems. Inspiration can be taken from some of the major earth science success stories; the global Argo ocean observing system, NSF’s Long-Term Ecological Research Program, and Ameriflux are particularly good examples. This is the scale needed for a truly worthwhile global evaporation observing system, but is more of a long-term goal. It will involve closer collaboration between hydrological, biological, meteorological, and climate communities. For example, Land Surface Models used within weather and climate models have greatly improved due to such collaboration and now include dynamic behaviour of plant stomata. Efforts can build on these modelling advances as well as current micrometeorological observing networks such as Ameriflux and FLUXNET, and further exploit the many current and planned remote sensing and reanalysis products. Our understanding of evaporation will improve, but the speed and extent to which this happens will depend on greater individual and community wide effort. Let’s make sure in a decade from now our list of evaporation limitations is outdated, our knowledge of the hydrological cycle is greatly improved, and this knowledge is being applied to solve real-world water problems – perhaps we could even say evaporation is no longer mysterious! Citation: Harrigan, S, & Berghuijs, W. (2016), The Mystery of Evaporation, Streams of Thought (Young Hydrologic Society), Published July 2016, doi: 10.5281/zenodo.57847. Shaun Harrigan (@shaunharrigan) is a research associate at the Centre for Ecology & Hydrology (CEH) in the UK and Early Career Scientist representative for the EGU Hydrological Sciences Division. Wouter Berghuijs (@wberghuijs) is a PhD researcher at Bristol University in the UK, co-founder of the Young Hydrologic Society (YHS), and is on the Outreach and Communication Committee of the EGU Hydrological Sciences Division. Correspondence to Shaun Harrigan (shauhar@ceh.ac.uk). We thank Michael Roderick (Australian National University), Christel Prudhomme (Centre for Ecology & Hydrology, CEH), and Henk de Bruin (Wageningen University) for their enthusiastic participation in the ‘Meet the expert in hydrology’ session at EGU 2015. The material in this article is strongly influenced by their presentations and ideas generated during the fruitful open discussion with the audience. Berghuijs, W. R., Woods, R. A., Hutton, C. J. and Sivapalan, M.: Dominant flood generating mechanisms across the United States, Geophys. Res. Lett., 2016GL068070, doi:10.1002/2016GL068070, 2016. Blöschl, G., Blaschke, A. P., Broer, M., Bucher, C., Carr, G., Chen, X., Eder, A., Exner-Kittridge, M., Farnleitner, A., Flores-Orozco, A., Haas, P., Hogan, P., KazemiAmiri, A., Oismüller, M., Parajka, J., Silasari, R., Stadler, P., Strauss, P., Vreugdenhil, M., Wagner, W. and Zessner, M.: The Hydrological Open Air Laboratory (HOAL) in Petzenkirchen: a hypothesis-driven observatory, Hydrol. Earth Syst. Sci., 20(1), 227–255, doi:10.5194/hess-20-227-2016, 2016. Coenders-Gerrits, A. M. J., van der Ent, R. J., Bogaard, T. A., Wang-Erlandsson, L., Hrachowitz, M. and Savenije, H. H. G.: Uncertainties in transpiration estimates, Nature, 506(7487), E1–E2, doi:10.1038/nature12925, 2014. De Bruin, H. A. R., Van den Hurk, B. J. J. M. and Kohsiek, W.: The scintillation method tested over a dry vineyard area, Boundary-Layer Meteorol, 76(1-2), 25–40, doi:10.1007/BF00710889, 1995. Guo, D., Westra, S. and Maier, H. R.: An R package for modelling actual, potential and reference evapotranspiration, Environmental Modelling & Software, 78, 216–224, doi:10.1016/j.envsoft.2015.12.019, 2016. Hirsch, R. M. and Ryberg, K. R.: Has the magnitude of floods across the USA changed with global CO2 levels?, Hydrological Sciences Journal, 57(1), 1–9, doi:10.1080/02626667.2011.621895, 2012. Jakeman, A. J. and Hornberger, G. M.: How much complexity is warranted in a rainfall-runoff model?, Water Resour. Res., 29(8), 2637–2649, doi:10.1029/93WR00877, 1993. Jasechko, S., Sharp, Z. D., Gibson, J. J., Birks, S. J., Yi, Y. and Fawcett, P. J.: Terrestrial water fluxes dominated by transpiration, Nature, 496(7445), 347–350, doi:10.1038/nature11983, 2013. Kundzewicz, Z. W., Kanae, S., Seneviratne, S. I., Handmer, J., Nicholls, N., Peduzzi, P., Mechler, R., Bouwer, L. M., Arnell, N., Mach, K., Muir-Wood, R., Brakenridge, G. R., Kron, W., Benito, G., Honda, Y., Takahashi, K. and Sherstyukov, B.: Flood risk and climate change: global and regional perspectives, Hydrological Sciences Journal, 59(1), 1–28, doi:10.1080/02626667.2013.857411, 2014. McVicar, T. R., Roderick, M. L., Donohue, R. J., Li, L. T., Van Niel, T. G., Thomas, A., Grieser, J., Jhajharia, D., Himri, Y., Mahowald, N. M., Mescherskaya, A. V., Kruger, A. C., Rehman, S. and Dinpashoh, Y.: Global review and synthesis of trends in observed terrestrial near-surface wind speeds: Implications for evaporation, Journal of Hydrology, 416–417, 182–205, doi:10.1016/j.jhydrol.2011.10.024, 2012. Oudin, L., Hervieu, F., Michel, C., Perrin, C., Andréassian, V., Anctil, F. and Loumagne, C.: Which potential evapotranspiration input for a lumped rainfall–runoff model? : Part 2—Towards a simple and efficient potential evapotranspiration model for rainfall–runoff modelling, Journal of Hydrology, 303(1–4), 290–306, doi:10.1016/j.jhydrol.2004.08.026, 2005. Prudhomme, C., Giuntoli, I., Robinson, E. L., Clark, D. B., Arnell, N. W., Dankers, R., Fekete, B. M., Franssen, W., Gerten, D., Gosling, S. N., Hagemann, S., Hannah, D. M., Kim, H., Masaki, Y., Satoh, Y., Stacke, T., Wada, Y. and Wisser, D.: Hydrological droughts in the 21st century, hotspots and uncertainties from a global multimodel ensemble experiment, PNAS, 111(9), 3262–3267, doi:10.1073/pnas.1222473110, 2014. Rodell, M., Beaudoing, H. K., L’Ecuyer, T. S., Olson, W. S., Famiglietti, J. S., Houser, P. R., Adler, R., Bosilovich, M. G., Clayson, C. A., Chambers, D., Clark, E., Fetzer, E. J., Gao, X., Gu, G., Hilburn, K., Huffman, G. J., Lettenmaier, D. P., Liu, W. T., Robertson, F. R., Schlosser, C. A., Sheffield, J. and Wood, E. F.: The Observed State of the Water Cycle in the Early Twenty-First Century, J. Climate, 28(21), 8289–8318, doi:10.1175/JCLI-D-14-00555.1, 2015. Roderick, M. L., Hobbins, M. T. and Farquhar, G. D.: Pan Evaporation Trends and the Terrestrial Water Balance. I. Principles and Observations, Geography Compass, 3(2), 746–760, doi:10.1111/j.1749-8198.2008.00213.x, 2009. Savenije, H. H. G.: The importance of interception and why we should delete the term evapotranspiration from our vocabulary, Hydrol. Process., 18(8), 1507–1511, doi:10.1002/hyp.5563, 2004. Sheffield, J., Wood, E. F. and Roderick, M. L.: Little change in global drought over the past 60 years, Nature, 491(7424), 435–438, doi:10.1038/nature11575, 2012. Sutanto, S. J., van den Hurk, B., Dirmeyer, P. A., Seneviratne, S. I., Röckmann, T., Trenberth, K. E., Blyth, E. M., Wenninger, J. and Hoffmann, G.: HESS Opinions “A perspective on isotope versus non-isotope approaches to determine the contribution of transpiration to total evaporation,” Hydrol. Earth Syst. Sci., 18(8), 2815–2827, doi:10.5194/hess-18-2815-2014, 2014. Teuling, A. J., Van Loon, A. F., Seneviratne, S. I., Lehner, I., Aubinet, M., Heinesch, B., Bernhofer, C., Grünwald, T., Prasse, H. and Spank, U.: Evapotranspiration amplifies European summer drought, Geophys. Res. Lett., 40(10), 2071–2075, doi:10.1002/grl.50495, 2013. Van Loon, A. F.: Hydrological drought explained, WIREs Water, 2(4), 359–392, doi:10.1002/wat2.1085, 2015. Vicente-Serrano, S. M., Beguería, S. and López-Moreno, J. I.: Comment on “Characteristics and trends in various forms of the Palmer Drought Severity Index (PDSI) during 1900–2008” by Aiguo Dai, J. Geophys. Res., 116(D19), D19112, doi:10.1029/2011JD016410, 2011. New paper in HESS by Schymanski and Or (2017) ‘Leaf-scale experiments reveal an important omission in the Penman–Monteith equation’. Full Citation: Schymanski, S. J. and Or, D.: Leaf-scale experiments reveal an important omission in the Penman–Monteith equation, Hydrol. Earth Syst. Sci., 21, 685-706, doi:10.5194/hess-21-685-2017, 2017. Excerpt from abstract: “We show that transpiration accounts for about 57.2% (with standard deviation ± 6.8%) of global terrestrial ET. Our approach bridges the scale gap between site measurements and global model simulations, and can be simply implemented into current global climate models to improve biological CO2 flux simulations.”. Full citation: Wei, Z., Yoshimura, K., Wang, L., Miralles, D., Jasechko, S. and Lee, X.: Revisiting the contribution of transpiration to global terrestrial evapotranspiration, Geophys. Res. Lett., 2016GL072235, doi:10.1002/2016GL072235, 2017.
its spatial pattern differ substantially between these three formulations.”. Full citation: Dewes, C. F., Rangwala, I., Barsugli, J. J., Hobbins, M. T. and Kumar, S.: Drought risk assessment under climate change is sensitive to methodological choices for the estimation of evaporative demand, PLOS ONE, 12(3), e0174045, doi:10.1371/journal.pone.0174045, 2017. Abstract: “Decreases in pan evaporation (Epan) have been reported around the world despite increasing air temperatures; this was attributed to reductions in wind speed and solar radiation. Using 42 years (1975–2016) of Australian Epan data, we reexamined Epan trends, adding over a decade of observations to previous analyses. Flexible local linear regression models showed that many previously reported decreasing Epan trends have plateaued or reversed. Attribution analysis confirmed that 1975–1994 Epan decreases in southern/western Australia were chiefly driven by decreasing wind speeds. Increasing vapor pressure deficit subsequently became dominant, resulting in 1994–2016 Epan increases. Climate trend analyses should consider applying flexible statistical models to qualitatively understand temporal dynamics, complementing linear models that are able to provide quantitative assessments, especially when multiple drivers are involved.”. Full citation: Stephens, C. M., McVicar, T. R., Johnson, F. M., & Marshall, L. A:. Revisiting pan evaporation trends in Australia a decade on, Geophysical Research Letters, 45, doi: https://doi.org/10.1029/2018GL079332, 2018.